All of our dyes are non-toxic and approved by the department of agriculture for food products. That means they will run if they get wet and will fade in the sun light. We ask that you allow four weeks to process dyed orders. DYED Red, Green, Brown, Orange, Purple, Pink, or Blue. Two or more colors. Two Tone Natural and one color. Dyed Bands All natural basket with dyed bands. 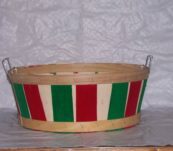 Peppermint Red, Natural, and Green basket with natural bands. 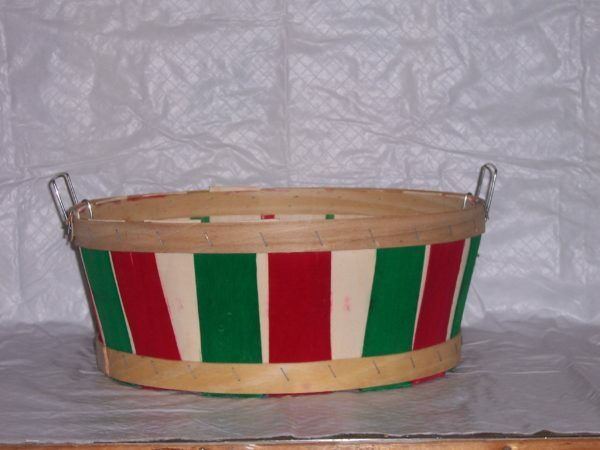 Patriot Red, Natural, and Blue basket with natural bands. Halloween Natural, Orange, and Brown, with Natural bands. Orders placed on line do not include handling and shipping cost. Due to the wide variety of out products selection. Most freight cost are not always known until after the order is processed. The most effective way to place an order is to call us toll free at 1-800-227-5385. This insures that the items you need are correct, in stock, and thus shipped to the proper location. The order is then packed and UPS charges can then be calculated more accurately. We will than notify you either by phone, fax or email, with a total before is completely processed. Sorry, we cannot ship to post office boxes. there is a $4.00 handling charge per box in addition to the UPS charges. UPS shipments are prepaid by Greenfield Basket Factory and added to your invoice. © 2019 Greenfield Basket Factory. All Rights Reserved.